AUTOGRAPHED BY COL. “TEX” HILL. As the majority of America watched the growing barbarism of World War II and chose to stay out of the fight, a small group of patriots volunteered to combat Japanese aggression in China under the leadership of Claire Lee Chennault. Known as the American Volunteer Group, this band of pilots, mechanics and support personnel set a standard of being first in any fight that has continued to this day. The missions have varied, as the airframes, but the attitude of volunteerism and a willingness to go wherever their country needs them continues on as a common thread. 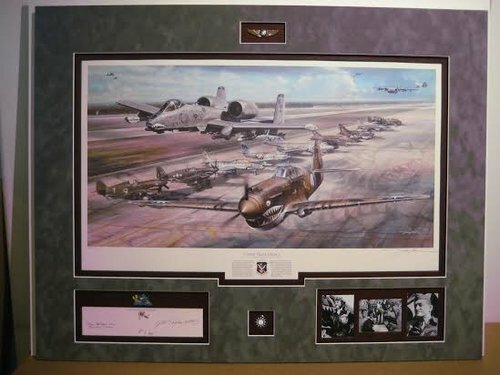 Whether downing Japanese fighters, destroying Iraqui tanks, or pulling wounded off the battlefield, the AVG spirit lives on today within the hearts of the Flying Tigers- From Burma to Baghdad and Beyond. In this scene, an P-40 flown by AVG and 23rd FG ace ‘Tex’ Hill flies alongside ‘Tiger 1” the A-10 Thunderbolt II flagship of today’s 23rd Wing, based at Moody Air Force Base, Georgia. 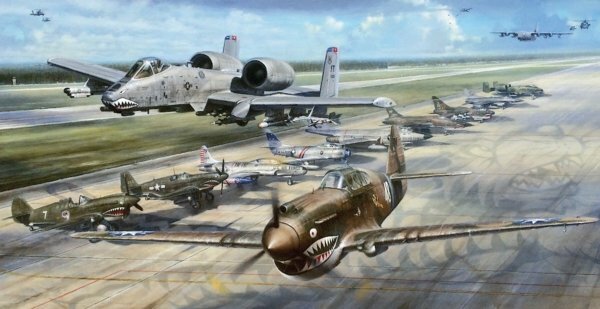 From WWII to the present, the 23rd has utilized multiple aircraft, including the ones shown here; P-40, P-51, P-80, F-86, F-101, F-105, A-7, F-16, and A-10. Also shown are the aircraft of sister units working S&R with the 23rd, including C-130 and HH-60.